In association with Wayne County Parks' Hobby Day MIGO members had a booth to introduce Geocaching to the participants. This was followed by the Crosswinds Marsh Meanderings Geocache event. 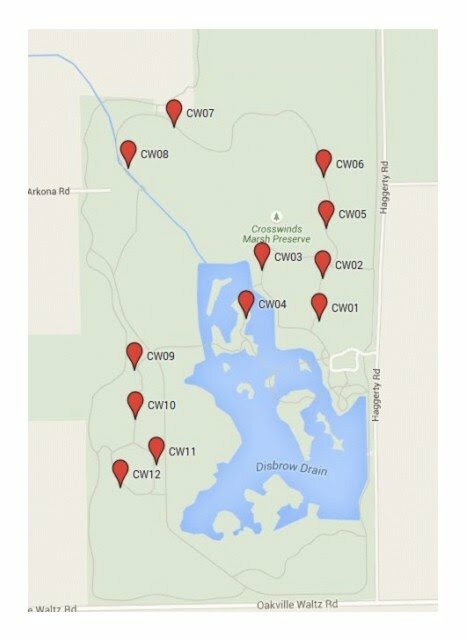 Twelve new Geocaches were launched for the event. When you have found all 12 Geocaches in the series and recorded the codes go to this On-Line Form and enter the codes. There is a special PathTag available for those finding all 12 caches and and entering the codes. Instructions as to where to send a self addressed and stamped envelope (SASE) will be sent by return E-mail. If you are intending to hunt for the new Geocaches in the series you should come prepared with long pants, shoes and socks (not sandals or flip-flops), and insect repellent. This time of year in the woods of South Eastern Michigan there are ticks and mosquitoes a plenty! Red name indicates PathTag was mailed. This site is maintained for the Crosswinds Cache Crew by Stan&Ruth. Questions and comments may be submitted through their profile.